Jasmin finished the Bon Bon Toque, a tincanknits design, yarn: Mountain Meadows Wool “Powell” #25000tuques #NewHomeNewHat. She mentions the Facebook page and ravelry group. Gigi finished two preemie hats. Jasmin has another Finished Object, the Turn a Square hat by Jared Flood, knitted out of Noro Kureyon. Gigi finished her Shades of Grey socks. 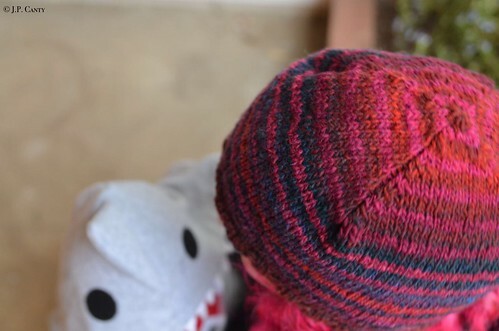 and she dug out yarn for the Rib-a-roni hat, which reminded her of the Käänteinen hat. She also worked on the Coronation Cardigan, out of Berry Colorful Yarnings. Gigi cast on a pair of Vanilla socks out of Patons Kroy in Brown Rose Marl. Gigi wore the Serpentine cowl, socks, and wristers. And Jasmin's Mondo Cable cardi. Jasmin wore her Mondo Cable cardi, and the Tess silk/wool hat. Genevieve wore the Elsa cardigan, the Elsa hat, Olivia hat, and Bumble hat, ola hat, and the Kapuzin hoodie, caterpillar cardigan. Rex wore the Purl Soho Baby cardi, handspun hat by lala. Andrew has been wearing his cashmere hat, and Sam wore the grey beanie. about yarn bombing and applying Lolo bars. Gigi mentions Die Urbane Spinnstube. Gigi's cowl out of mistery batt got bound off to tight, so she tinked and bound off again. She bound off looser, and won Yarn Chicken. She dropped a stitch on her Shades of Grey sock and then had to go back and crochet up the dropped stitch. She also frogged back quite a bit on the 1000 Tulips shawl, it was too short and needs another pattern repeat. She is talking about Whorlicity vs Point of Inertia, asking whether people would prefer scientific terms or fiber terms. Also, if you have a better sounding word or phrase, suggest it! The term that everyone is searching for is a word that describes how long a spindle turns. Gigi basted a pair of jeans, for Sam in order to shorten them. Also, she wants to keep the original hem in place, since original hems on jeans have too many layers for a home sewing machine. She says she has seen this technique all over Pinterest. Long time listener recently returning to regular stitch habits. It was a thrill to hear you speaking so highly of my favorite designer Woolly Wormhead. Congrats Jasmin on finishing your WW sideways hat! I thought you'd want to know that several of us are doing a 12 in 16 knit a long to make 1 WW hat per month. Would love to have you join us!! P.S. I will link to this episode of your podcast so that more folks can find your amazing podcast.